Purpose: to assess radiographically the prevalence of spondylolysis and spondylolisthesis in symptomatic athletes from plain radiographs. 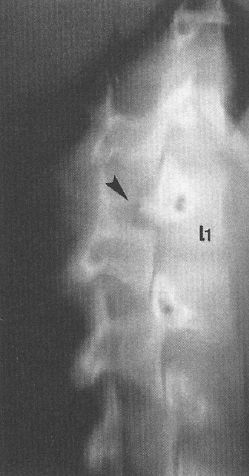 Methods: a retrospective analysis was conducted on the plain radiographic lumbar spine series of 4243 male and female athletes with symptoms relating to the lumbar spine. Results: the study showed that 590 athletes (13.90%) had a radiological diagnosis of spondylolysis with concomitant spondylolisthesis in 280 of these (47.45%). Conclusions: high prevalence of spondylolysis in athletes with low back pain compared with the general population suggests that it would be good practise to include a radiological examination of the lumbar spine in symptomatic athletes engaged in sports who are considered to be at risk in the light of this and other studies. Key words: low back pain, stress fracture, sport injury. The purpose of our study was to ascertain the incidence of the pars defects as demonstrated radiographically in a symptomatic elite athletic population. 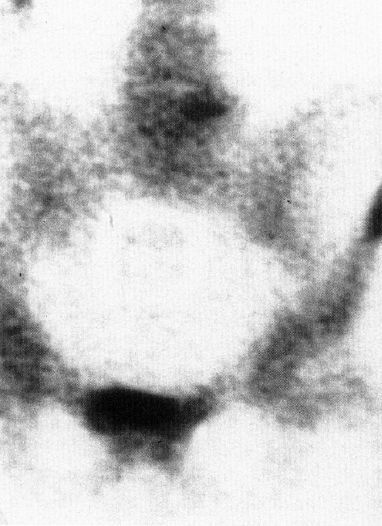 A review was conducted of 4243 full series on each individual patient standing with plain radiographs of the lumbar spine including antero-posterior (AP), lateral and oblique views, from male and female athletes aged 15-27, referred to the Italian Olympic Committee's Sport Science Institute, between 1962 and 1998. All the images were interpreted by the senior author (FR) during the last 36 years. 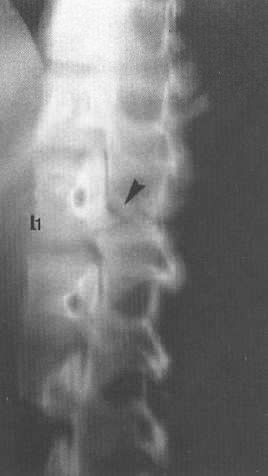 All the athletes who underwent radiography, suffered from low-back pain (interfering with sports activities) either acute in onset or chronic with acute exacerbation. In cases of uncertainty these views were complemented by oblique tomography; (accurate gonadal protection was applied). In 19 cases, flexion and extension views were taken to demonstrate mechanical instability or spondylolisthesis. A grade 1 spondylolisthesis is present when the posterior aspect of the displaced vertebral body lies between the posterior aspect of the sacrum and the first of the four divisions. Concomitant spondylolisthesis was found in 280 cases (47.45%) with grade I forward displacement in 75.5% (211 patients), grade II displacement in 23.21% (65 patients), and grade III displacement in 1.43% (4 patients). No patient in the study had a grade IV spondylolisthesis. Flexion and extension views, with the subject standing, did not demonstrate any instability of one vertebra on another or changes in angulation. Lumbar spondylolysis is considered be an acquired lesion, universally recognised as a fatigue fracture of the pars interarticularis, provoked by high static and dynamic sectorial stresses. The diagnosis of spondylolysis can be made by different imaging modalities including plain radiographs, bone scan, computed tomography (CT) scan or magnetic resonance imaging (MRI). Bone scintigraphy has been used in the past for evaluation of low back pain, because of its high sensitivity to alterations of bone metabolism, depicted as areas of increased radionuclide uptake. It is widely accepted that MRI offers the most comprehensive evaluation of the lumbar spine, excluding more sinister pathology as malignancy or infection, and demonstrating degenerative disc disease, facet joint arthropathy, spondylolysis, spondylolisthesis and other causes of back pain. [29-31]. However, views are mixed on whether MRI can adequately demonstrate pars defects [32-34]. 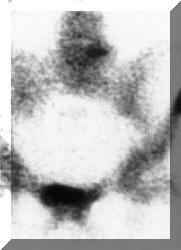 Spondylolysis can be difficult to identify on MR and there is a high associated false positive rate . CT allows better visualization of bony detail and when performed with reverse-gantry angle and thin sections, is the imaging modality of choice for identifying spondylolyses. The results of our study confirm the high incidence of spondylolyses demonstrated radiographically in athletes with low back pain (13.9%) but probably the addition of different imaging modalities would increase this value. Spondylolyses were more commonly seen in sports characterised by forceful and repetitive hyperextension-hyperflexion and /or rotation of the lumbar spine; according to Table 1, this suggests that the actions of certain sports (especially in the first ten listed sporting activities) may predispose athletes to develop stress fractures of the pars interarticularis. Fig. 2 -Oblique tomography showing bilateral L2 isthmic defects with interposed free articular fragments. Fig. 3 - Oblique tomograms: bilateral L1 isthmic defects. Fig. 4 - Oblique tomography with three levels (L2 – L3 – L4) of isthmic defects. 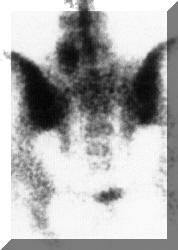 scintigraphy of the same case with increased radionuclide activity in the left L5 isthmus.